We are extremely pleased to announce the introduction of atDNA 6.0, the latest and most advanced build of the forensic database used in our DNA Fingerprint family of ancestry tests. The new version includes for the first time a special Native American population named U.S. Cherokee Admixed (n=62). 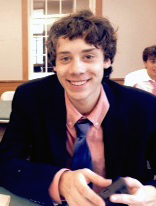 One of the first to take the test for a Cherokee match was Zachary R. LaRocca-Stravalle, a sophomore at the Forman School in Litchfield, Connecticut (photo). His donor-dad is a non-enrolled admixed Cherokee, and there are stories on his maternal side of his grandmother’s romance with a Scots-Irish-Cherokee U.S. Army Air Forces bombardier during and after World War II. Zach’s U.S. Cherokee Admixed match came out as no. 4 on his world populations report, very high, suggesting a rather large amount of American Indian admixture. The anonymous Cherokee sample was created from the forensic profiles of participants in our ongoing Cherokee DNA Project plus a random selection of customers who indicated to us that they identify as Cherokee/Native American. It joins 24 American Indian populations already in the database and will be automatically searched and reported as a match in all DNA Fingerprint Plus tests, beginning with its release date today. While the rank of any match is only relative to other matches and can’t tell you how much or what percentage of that ancestry you carry, a match to a population in the top 50 is of some significance. Your American Indian quotient will also be reflected in your list of megapopulations, where Cherokee is one of 25 possible contributors. Again, however, there is a caveat that rank cannot be equated to percentages. Percentages and ratios just don’t make for a scientific result, as no population is pure or unmixed. Customers who took a DNA Fingerprint test before atDNA 6.0 can find out the rank of their Cherokee match by ordering the Special Cherokee Match Update ($50). Use your customer promotional code to receive a 15% discount on it (good until December 31).